Layoffs and loss of some services are expected as North Forest ISD begins looking at ways of making up a $7.3 million budget shortfall. During a special called meeting of board of trustees on Jan. 19, the district said that they will not be getting as much money from the state as previously expected so they would have to make up the lost revenue by reducing their M&O or maintenance and operations budget. According to Interim Superintendent William Jones the Texas Education Agency (TEA) is withholding $7.3 million in state funds, saying that it overpaid the district for the 2006-2007. School districts receive funds from the state based on student enrollment. The state says that the school district over-reported its enrollment. Williams admitted that no one at the district had updated the enrollment figures that went to the state. Sources indicate that over the past five years the district had seen an over 3,000-student drop in enrollment. In most districts when an emergency comes up such as a natural disaster or expected loss of state funds they can turn to their fund balance, which is a type of rainy day fund. This is not an option for North Forest. Williams said that overspending and inaccurate budgeting has left the district with a $5.1 million deficit in its fund balance. In order to make up for the lost state funds Williams said that each department would have to come up with at least an 11% cut in their budget. How this will affect the approximately 1,400 district employees is yet to be determined. However, it is believed that cutting back services and non-employee related expenses would not be enough to make up the $7.3 million. This month students returned to Forest Brook High School after attending classes at Smiley the first semester while repairs were made at their campus. One suggestion offered by Williams is that consolidating the students into one high school would cut costs. He also favored keeping the students of Hilliard and Tidwell Elementaries combined. The Tidwell campus was closed in October when mold was discovered in the school. Financial troubles are nothing new to North Forest. Last year the TEA began an investigation into FEMA funds sent to the district for school repairs. In 2001 $10 million was sent to the district to pay damages caused by Tropical Storm Allison. Later another $13 million was sent to the district. When the district was asked to document how the funds were spent it could not produce adequate records. During this time the district also used school bonds that were supposed to go for new construction to make the repairs based on the promise that 75% of the money would be reimbursed if documented. The documentation did not come. In March 2007 the TEA appointed a conservator to the district to oversee its finances. The same month the school board fire Superintendent Dr. James Simpson. The missing documentation occurred before Simpson came to the district. Simpsons firing led to a wrongful termination lawsuit being filed against the district. Last week the board voted to rehire Simpson as superintendent. The district also had unexpected building expenses with the mold remediation at Tidwell and then $1 million in repairs and renovation at Forest Brook High School following last summers vandalism. 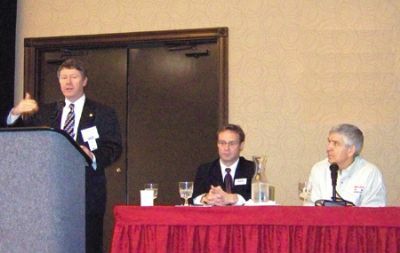 NORTH HOUSTON Five speakers at the NHG Chambers Annual Economic Forum looked for the bright side of the economy in their areas of expertise, but the keynote speaker, Mark Dotzour, thought we are on the verge of a recession, and that the government and business ought to admit it as part of the remedy for getting out. Although he admitted that economists are often 50% wrong in their predictions, nevertheless he reviewed various factors in our nationwide economic picture that are in trouble, including credit markets, housing, commercial real estate, and commodity prices. However, in contrast to the nation, he saw Houston and Dallas maintaining a bright spot in their local economies, especially in real estate. Although he predicted that 2008 will be a difficult year, he saw things improving in 2009, and after 2010 he thinks the economy is set for a very good future. Lower federal interest rates will continue, and the adjustable rate mortgages will expire, helping that market. Even oil prices should fall, he said, perhaps to the real cost of $60 a barrel. His suggestions for current investments to protect your capital in a falling market include gold, high quality commercial real estate, land, foreign currency, and 10 year treasury bills. He noted that Oil prices, such as $100 per barrel currently, are cyclical, and will adjust downward. Currently these prices are benefitting Texas towns with economies based on oil. Other speakers included Gallery Furnitures Jim McIngvale, who welcomed participants and spoke on the retail economy. Although he saw 2007 as one of his slowest years, he suggested that chaos always should be looked at as an opportunity for innovation and improvement. He also announced that Gallery will furnish 132 USO offices throughout the world without cost, as a donation to servicemen and women. Judge Ed Emmett spoke on transportation matters, and how they affect the economy. Historically and currently, he felt that Houston was a transportation hub, with great promise for the future if we continue to develop a coordinated system that includes rail, highways, toll roads, and port facilities. He said that Houston has the potential to become the Global Port for the whole United States. Fred Caldwell spoke on the strong commercial real estate market in Houston and the Greenspoint area. He indicated that nationally, the Texas area is considered desirable by corportaions that are relocating, due to a pro business climate, and a high quality of lifestyle. Sue Payne, of ExxonMobil, spoke about energy need in the future, and how oil companies are developing plans to meet the needs, beyond current methods. North Forest ISD trustees, after months of searching for a new superintendent to replace the one they fired last March, came up with a surprising answer last Wednesday night  they chose the fired school head, James Simpson as the lone finalist by a 4-3 vote. This spread, similar to the vote that fired Simson, is an indication of the inherent strife present between the board members. Yet the vote in one way indicates the desire of the board for reconcilliation, and a new course for the district. After a state mandated 21 day waiting period, and another vote, Dr. Simpson will be able to return to his office and continue the work of fixing the problems with this troubled school district. Simpson was one of three finalists considered by the board, as a result of search work done by TASB. The others were not named, but the board indicated that the presentation for Simpson had been very positive. North Forest is now operating under the guidance of two state TEA conservators, one for financial matters and one for academic problems. During the meeting, controversy continued, as T. Marie McCall explained that she had changed her position, and voted for Simpson this time, because she thought this was best for the children of the disrict, and that Simpson would land on his feet with momentum for improvement. In contrast, when Trustee Pastor Charles Taylor Sr. voted, it was a resounding Hell NO that later elicited an apology for the profanity from Trustee Williams. Taylor said in his remarks that he thought Simpson had the worst record of any of the candidates, and should answer for previous NF problems, including the finances and the control of the administration. Several board members indicated that they had voted for Simpson with the hopes that the boards involvement in affairs would end, and he could run the administration without micromanagment from the board. Provost and Ross indicated that the vote was in the best interests of the students, and looked forward to the board and administration working more as a team. Provost indicated that previous problems were not created by Simpson, but before he took over and that he had been working to correct them. This included hiring bonuses for teachers, a new curriculum, and working with local community colleges on credit courses for high school students. Here it is the fourth week in January and Wal-mart has tomato plants. Its the single pot variety of plants which cost more than the six packs and dont cut the mustard as far as the gardening guru from Highlands is concerned. Just dont have the luck with planting them compared to the multi-plant sets he said. Manage to get two bundles of the onion, one Texas 1015 and Georgia Sweets AKA Vidalias from the Wal-mart this morning. Kills my back to plant them thangs but they are so good once the tops dry out. The guru will have tomatoes in the ground next month if you can believe it. Ive seen it, fact. Tis! Moons ago in Scotland the game called Gentlemen Only.. .Ladies Forbidden was invented, thus the word GOLF came about. Its impossible to lick your elbow. The cost of raising a medium-size dog to eleven years old will run you over $16,000.00. If a statue in the park of a person on a horse has both front feet in the air, the person died in battle. If the hoss has one front leg up, the person died because of wounds received in battle. If the horse has all four legs on the ground, they died of natural causes. In the ole bars when one had too many pints and quarts, the old bartender told them in a loud voice, Mind your pints and quarts and settle down. Then you get the phrase mind your Ps and Qs. Those days are dead and gone but its the new age. The age when you have more Pins than you can remember; not to mention passwords. Ive tried to use my phone as the mouse many times and vise versa. Your phone book is your cell phone. Youve entered phone numbers on your keyboard in lieu of your phone. Had to use another phone to call your cell phone so you could locate where you left it. Finally leam how to text message someone. Call someone in the house to come help tote in the groceries. NORTH HOUSTON The public came a step closer to having a comprehensive light rail system in the city of Houston, when METRO opened a neighborhood office at 2613 Fulton, to interact with the public who will use the North Corridor Light Rail line, from downtown Houston to Northline Mall. Last Saturdays opening ceremonies featured entertainers from nearby Jeff Davis High School, including the JROTC Color Guard, the Mariachi Band, and the Ballet Folklorico. The national anthem was sung by Madelene Rios. Public officials and METRO staffers also participated in the opening ceremonies, and gave brief remarks. These included Harris County Commissioner Sylvia Garcia, City Councilman Adrian Garcia, and State Representative Jessica Farrar. Metro staffers included Helen Cavazos, Mike Martinez as emcee, and board member Trini Mendenhall Sosa. Also present was Northside Management District Exec. 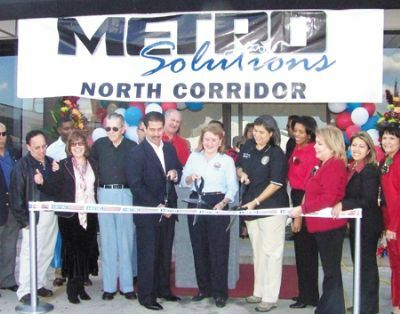 Director Rebecca Reyna, and Metro Assoc. VP Kim Williams. Metro has opened this office, and several others in other neighborhoods, for the public to visit, share questions and concerns, and learn about the overall METRO Solutions programs. However, Fare items will not be sold at the METRO Solutions corridor office locations, according to the material furnished to the Northeast News. Metro announced that the plan for the North Corridor line had been changed from BRT (Bus Rapid Transit) to LRT (Light Rail Transit). In October 2007 METROs Board of Directors approved light rail technology for all five of the transit corridors. Due to recent changes in the way the Federal Transit Administration evaluates proposed transit projects, the Board was able to respond to the communitys preference for LRT versus BRT. Regarding METRO Solutions, they said that this is a long-range transit plan comprised of a comprehensive, multi-modal system to be built over the next decade. It includes 30 miles of Light Rail Transit, new transit centers, park and ride lotes, HOV/HOT Lanes with future plans for commuter rail and signature bus services. NORTHEAST HOUSTON Voters in the Aldine area gathered last Thursday night, at a public forum sponsored by the Texas Together Education Foundation. The event was held at the Pure Light Missionary Baptist Church, at Aldine Mail Route at Vickery. The democratic s primary election for the office of state representative will be held on March 4th. 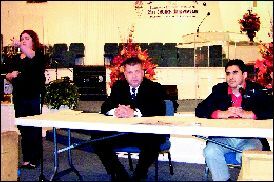 The two candidates, Kevin Bailey and Armando Walle, were on hand to participate in the question and answer format. About 75 members of the public attended, and seemed to be evenly divided in their support of the candidates, or not committed at all. The format for the evening was opening statements by the two speakers, then questions from the audience with responses, and then closing summary statements. In his opening remarks, Kevin Bailey spoke about his length of experience in the legislature since 1991, and some his accomplishments. These included chairmanship of several important committees, inception of three management or improvement districts, increased police protection in these districts, sewer and water improvements, sidewalks and streetlighting projects that are a result of legislation worked on and passed with Baileys efforts. Also mentioned was the establishment of a Sheriffs storefront office on Aldine Mail Route, and this year an expansion of the Childrens Health Insurance Program to include an additional 130,000 children in the state. Armando Walle, in his opening statement, pointed out that he was a lifelong resident of the district, having been born and raised here, educated at Aldine schools and graduating from MacArthur High School, and still living in the district, as is his family. He emphasized that the economic conditions in which he grew up are similar to many residents who still live here, and that this gives him a unique perspective on the area. Walle emphsized his experience in work in Congressman Gene Greens office, as a staff member, and other staff work he did for Rep. Rodney Ellis and Congresswoman Sheila Jackson Lee. He also mentioned his interest and involvement in the education situation in the area, and specifically mentioned his work at Sam Houston High School as a mentor to the students. He emphasized two qualities that he would bring to the job, hard work and accessibility by the public. In the Question/Answer portion of the meeting, the first question was why improvements take so long to happen, and why so many street vendors are allowed on Aldine Mail. Bailey answered that he also thought that the process was extended, but pointed out that in Texas much of the intiative has to come from the county, not the state. Walle suggested in his response that many of these issues could be taken to federal and state officials that could be asked to help speed up the process. The next question asked for more bike and auto patrols. Bailey agreed, but suggested that he had voted for legislation to increase school police, storefronts, and contract deputies. Walle said we simply need more resources devoted to this issue. In response to a partisan question from the floor, Walle elaborated on his activities for the district, including work at the NHG YMCA, volunteering at Y.O.U.T.H., on the board at the Health Clinic, worked on the flooding problem while in Cong. Greens office. On increased police protection, Bailey noted that the task force he participated in during December, actually happens several times a year, and he also recommended that the Sheriffs office use civilians as jailers, to free officers for street patrols. Immigration was a question that both candidates found difficult to answer, but Bailey noted that it actually needs a national solution rather than a state answer. On CHIP, Bailey noted that his committee had uncovered fraud in the program, and saved money. From the floor, Airline I.D. chairman Glenn Nitsch spoke in thanks for the h1elp that Bailey has given to the neighborhoods. On education, both Bailey and Walle agreed that schools spend too much time on TAKS test preparation. Bailey noted that he passed legislation prohibiting the closing of Sam Houston and Kashmere high schools. Both candidates expressed support for a statewide smoking ban, if uniform and fair. In summary, Walle emphasized his relationship to the community, his work ethic and commitment to hard work on a full time basis, and his belief that it is time for a new breed of leader in Dist. 140. Baileys summary mentioned his experience, his seniority in the legislature which benefits the districgt, and his knowledge of how to accomplish legislation. Bailey also reviewed his accomplishments since he has been in office, including the management districts and the benefits they have brought to the area, noise abatement, water and sewer projects both accomplished and planned, work at a state and local level to improve DNA crime labs and get them properly accredited, and fighting against lobbyist influence in state government. 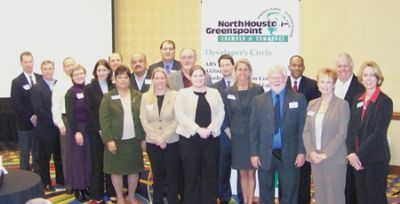 GREENSPOINT At an Awards Banquet and Installation Ceremony last Thursday, new officers and board of directors of the North Houston Greenspoint Chamber of Commerce were sworn to office for 2008. The event was underwritten by the Caldwell Companies. Outgoing board chairman Bill Ginder relinquished the gavel to new chairwoman Jill Boullion, as the new committee chairs were introduced as well as the board. The luncheon was also an awards presentation, to chamber members that have contributed to the welfare of the chamber or the community in 2007. As part of the transition, President Reggie Gray gave a state of the chamber address, outgoing chairman Bill Ginder gave an overview of his term of office, and incoming chair Jill Boullion outlined her plans for the coming year 2008. 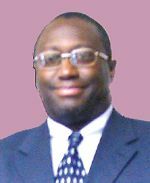 President Reggie Gray said that membership had increased from about 300 the previous year, to about 400 plus at the end of 2007. This is important, he explained, because active growing membership drives the success of all the other activities of the chamber. Gray introduced the new office staff, and reviewed improvements to the office procedures and computer equipment. He thanked the members for helping him make the Chamber the most important thing in his personal life. He then described the Chamber as a Community Table to which everyone is invited, but to which only a proper feast occurs when each brings a dish to share with others. Gray described his goals for 2008 as retention, stability and growth. Chairman Ginder talked about the year as a Roller Coaster event for him, with many successes, and a few personal low points as he visited the hospital twice. High points he described included the Young Professionals Network, the Economic Forum, lunch and learn events, and emerging leaders in the community and Chamber. Small Business Award, Margaret Eyster, Magoos PrintShop. Jill Boullion was sworn in as the new board Chairperson by Susan Hill. It was noted that Boullion is the second woman to hold this post, and that Hill was the first. In her remarks, Boullion thanks the Chamber, ABWA and Leadership North Houston for preparing her for this role. She said that her goals for 2008 were 500 members, through growth and retention; promoting the Chamber to a greater extent in the community, with member benefits; and development of the commettees to better serve the members of the Chamber. She admonished that WE are the Chamber, and to make the Chamber your Road to Growth. 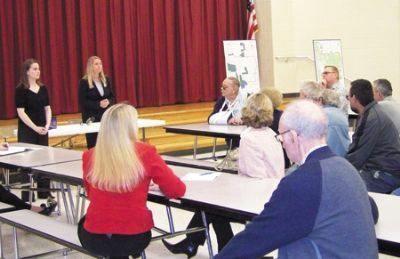 AIRLINE DISTRICT The public got to ask more questions, and hear an update on the status of the engineering study that is being conducted in the District, as a necessary step to get funding for new water and sewer lines for most Airline District properties. The meeting was last Thursday evening, at Carroll Academy on Gulf Bank, in the district. About 150 persons, most of them residents, turned out to listen and express themselves on the subject. Speakers for the evening included State Representative Kevin Bailey, Melissa Hamous of Harris County, who is in charge of the study, and Airline Exec. Director Teri Koerth. Also present as observers were district board members, and Kathleen Garrett, a representative from the Texas Water Development Board, the state agency that will eventually okay the funding for the project. Hamous said that this is a 30 year study meaning that all the improvements might take that long to be realized. But she said that some of the work would start much sooner, as funds and grants were received. She pointed out that grant money is required to accomplish the work, since the county and the city will not pay for utilities. She pointed out that in the East Aldine Management District, after about 4 to 5 years the first sewer project for 100 houses has been completed, and two other project areas are set for construction this year. At present, it looks like water and sewer will cost about $50 per month per home for the new system. Some speakers in the audience thought that a solution might be to ask the city of Houston to annex the area. Although this would increase residents taxes and water bills, at least the city was seen as a dependable source to solve the problems. In other comments, Hamous said that fire hydrants would be included in the construction. Although flooding reduction is not part of this sewer study, she pointed out that other agencies are in the process of studying flood reduction, and some work has already been done. This was reported in the Northeast News las week, with retention lakes built in Keith-Wiess park. The next regular district board meeting is Thursday, Jan. 31 at 11:30 a.m. in the Little York VFD building. 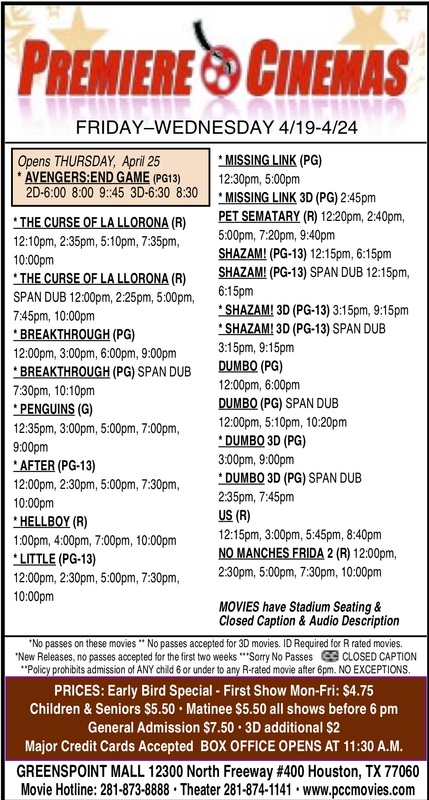 The public is welcome. Another water and sewer meeting will be held in a few months for the next update and conclusion of the study. Craig Loston is a defensive coaches dream. Hes big, fast, agile and has a knack for making big plays when his team needs them. That was evident during the 2007 season with the 6-foot-3, 205-pound free safety saved three key games for the Eagles during their 7-0 run through District 19-5A, which earned them the league title and a trip to the playoffs. Loston recorded 85 unassisted tackles, 15 assisted tackles, forced three fumbles, received three fumbles, came up with three interceptions and scored twice on a fumble recovery and an interception. He also made his presence felt on special teams and offense as he returned a punt and a kickoff for touchdowns. When called upon to assist on offense, he came through there, as well. Loston carried the ball three times for 74 yards, but scored on two of those rushes. He also caught one pass for 37 yards, and you guessed it, a touchdown. Interim head coach Ray Evans said Loston is one of the best athletes hes come across during his 31 years as a coach. Evans said Loston was a key reason why the Eagles won the 19-5A title this past season. He pointed to three key plays he made in games against Nimitz, Aldine and Stratford that allowed the Eagles to pull out all three victories in key league games. And while Loston has been blessed with God-given talent, he also has something else working in his favor, Evans said. Evans believes if Loston continues to work hard, he could take his game beyond just the college level. Loston is also a good citizen, Evans added. 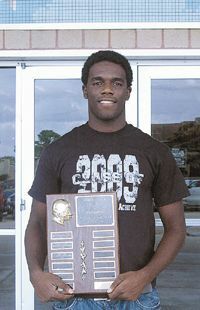 In addition to playing football, Loston excels at track and is a vocal presence among his teammates. And thats a good thing for the Eagles, but not such a good thing for Eisenhowers 2008 opponents. Oh 8 is upon us so, grin and bare it whatever the blessing or curse may be. With the price of gas trying to catch up with a gallon of sweet milk, it is going to put a lot more people in the poor house. There is plenty of room for everybody so come on in. Having heard and read several predictions for Oh 8, some good, some not, others cause concern for worry. Should the price of petrol go to four bucks a gallon, yours truly would not be surprised because those over yonder are out to ruin this great nation. Who will win the Super Bowl? Have not watched the first game and dont know who is playing; Texans and Cowboys? Rick Perry will be tapped to Vice President of the United States. Since its a do nothing job, hell fit right in. Border crossings back into Mexico will increase with the return of unemployed housing laborers. Real estate prices will continue to decline throughout the year and repossessions will continue at record pace. Interest rates will continue to drop somewhere from a quarter to two percent. As the price of petrol increases many independent businesses will shut their doors; from body shops to real estate and related companies. Many staff reductions are forth coming. Grocery stores to hardware stores will be increasing prices due to the high price of petrol especially diesel, and will layoff personnel. Look about your house and you will notice about every thing in your house is delivered by a truck. Also associated with rising petrol prices are school tax increases to pay for the petrol used in the thousands and thousand of school buses. One thing for sure back when I walked to school, walking wasnt crowded. Of course with some of todays kids, they have to be bussed because some kids dont have enough sense to get out of the street much less the rain. Restaurants will continue to serve smaller portions and increase the price of everything on the menu. The Writers Guild will go to the wayside, same way the air traffic controllers did. And to think all this time, I thought Bob Hope came up with his own jokes. Thanks for the memories anyway. One major car dealership in Baytown will close. Stainless steel appliances will no longer be the trend since current owners have found out they are hard to keep clean and rid of fingerprints. Good health will be the slowest possible rate at which one can die. Mad-cow-disease is located among millions of cows in America but we havent a clue as to how to locate millions of illegal immigrants or a terrorist. The Department of Agriculture will be in charge of immigration.